You’re ready to buy a house to turn into a rental! This is an absolutely amazing, exciting, and thrilling time — and of course, a time that’s filled with decisions to be made. Do you want to turn this property into a regular rental? Or are you leaning more towards using your non-recourse loan to purchase this house with the intent of renting out to vacationers and tourists? Should you buy a higher value property? Or go with a fixer upper? The latter questions are among the most popular debates in today’s buying world. Many people are taken by the DIY trends of today, and love the idea of taking something and making it into their own. And yet, there are many misconceptions about buying a fixer upper that are often overlooked by home buyers. In this two-part series, the IRA non-recourse loan lenders at First Western Federal Savings Bank are going to examine the best option for buying a property to turn into a rental. Today’s post will dive into the myths of buying a fixer upper. Whether you’re looking to create a housing or vacation rental, a non-recourse loan is the step you need to make this happen. Choose First Western Federal Savings Bank for your IRA non-recourse loan lenders, we’d be honored to help you get started! Myth 1: Buying a fixer upper is cheaper. This is likely the most common of the house buying myths. A fixer upper is the colloquial term for a home that’s seemingly cheaper to purchase, because there are many changes that are needed to be made. This is not a home that you’ll buy and will be more or less ready for your renters to move in, this is a property that requires a lot of work in order to be a functional home. Unless you are a general contractor or have years of experience with construction, plumbing, electrical work, and other things of the sort, there’s a good chance that you’ll come into looking at a fixer upper without being able to see all the work that truly needs to be done. You’ll need to hire an inspector to start, which of course, is an expense — albeit a necessary one. In the event you forego hiring an inspector, there is a pretty good chance that you’ll come across issues down the road that will absolutely require work. The foundation might be a bit shoddy, the carpet might be on its way out, there could be mold — there are tons of scenarios in which you’ll see why a fixer upper is called as such. And while you might have budgeted for most (or even all) of the upfront costs, these hidden costs down the road might end up hitting your wallet harder than you’d originally anticipated. From crazy plumbing and electrical wiring to crumbling foundations, there are plenty of properties that get bought as fixer uppers, but probably should never have been bought in the first place. These are the hopeless cases, where fixing them up ends up being more like building an entire new house. And, as you might have guessed, it becomes incredibly expensive to make this happen than if you had simply bought a higher value property in the first place. When is it actually cheaper? For all the horror stories of buying a fixer upper, we do have to admire the ambition and determination to take on such a project. And it should be stated that there is an example of when buying a fixer upper is cheaper: if you know how to do all the necessary work yourself. If you know how to do everything, from start to finish, on your own, you could end up saving money — provided the projects at hand are not more expensive than buying a higher value property. You would need to pay for parts and materials, but you wouldn’t have to pay for the additional cost of labor. That being said, this involves you knowing how to work everything from tearing out carpet to electrical and plumbing work. In some fixer uppers, the electrical work or plumbing needed won’t be so astronomical that it would be more valuable to purchase a higher value property. However, in many instances, the price of hiring someone to do an overhaul for these two complex aspects of renovation — on top of everything else — will definitely not result in a cheaper property buying option. 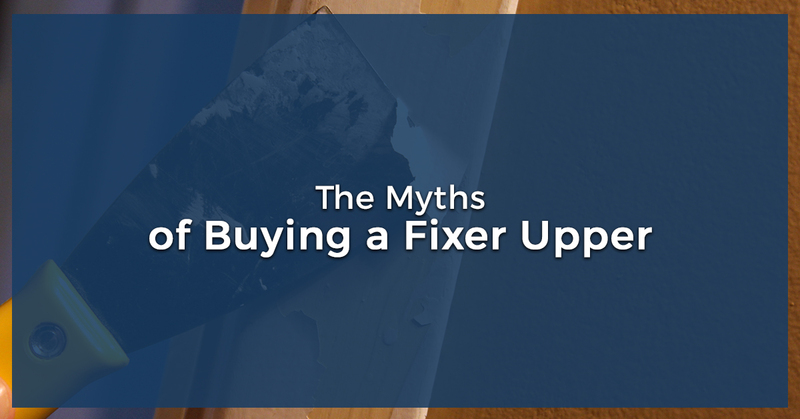 Myth #2: A fixer upper is a worthwhile project. For many, a fixer upper is truly a worthwhile project. Getting to work with your hands, spending time building and constructing something, seeing your finished product — all of these aspects of working on a fixer upper invoke a sense of pride. However, this is the idealistic vision of working on a fixer upper. Everyone loves the thought of spending a warm spring day sawing some wood and polishing some newly-built cabinetry. 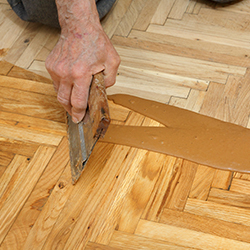 What people don’t love is the backbreaking labor of laying tile, or the hours spent over some form of tedium, like scraping away outdated wallpaper. The truth is, a fixer upper is far from glamorous, and the things that will take the most time will nearly always be the least enjoyable. Especially if you have any health issues, such as back or knee problems working on a fixer upper could aggravate these existing conditions. This could not only affect your daily life, but it could lead to having to spend even more on medical bills. Not to mention, this is a time intensive project that requires you to have, well, time. Unlike the shows that pop up on HGTV which convey extensive renovations completed seemingly in a matter of minutes, this is a source of strain for many people. Ultimately, a fixer upper can be a worthwhile project, but you have to know what you’re getting yourself into. For the costs, the time, and the labor, a fixer upper may very well not be a reasonable project. There is, however, a far more lucrative option (and one that still enables you to profit off of turning a property into a housing or vacation rental). Myth #3: Any house can be saved. We’ve kind of touched on this, but it should be mentioned that with the fixer upper mentality, you have this wonderful quality of being able to see the potential in something. This is an amazing ability, and should not be changed, but there does need to be an element of reality involved — especially when such a huge financial decision is on the line. Simply put, there are some houses that just won’t do for fixing up. And as a reminder, our non-recourse loans cannot be designated for construction purposes. When something is too far gone, it’s best to acknowledge the truth, as sad as it may be. In our next post, the IRA non-recourse loan lenders at First Western Federal Savings Bank will explain some of the benefits from choosing a higher value property. The upfront costs might seem overwhelming, but this is far more preferable than buying a fixer upper, in many ways. With your self-directed IRA, you can work with our team of lenders to get a non-recourse loan. Contact our team to learn more, and check out our YouTube channel for more information — we look forward to hearing from you!